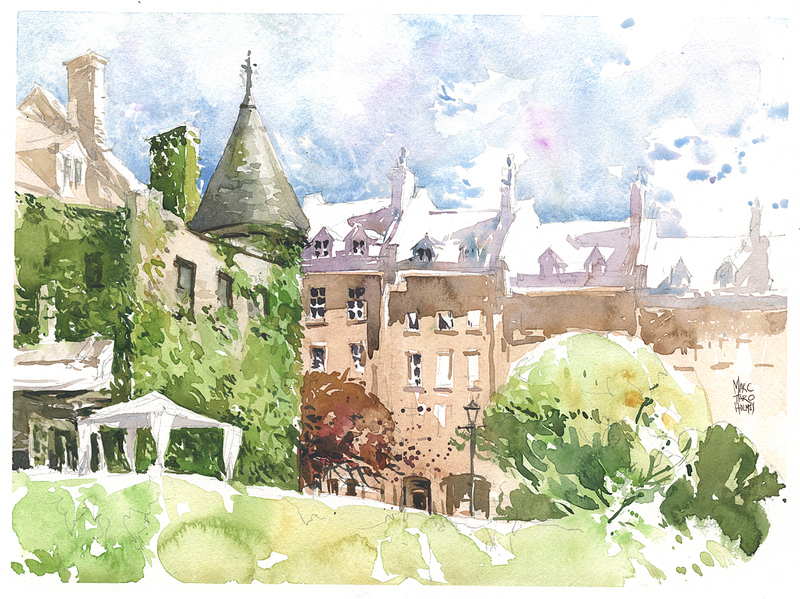 Just off of Place Jacques Cartier – where I was night sketching the other day – is the Musée du Château Ramezay. The historic house features costumed docents giving tours and serving lunch wearing 19th century clothing. I’ve never actually been inside myself – I’m sure it’s full of interesting draw-worthy artifacts. Perhaps that’s best saved for a bad weather trip? Just the other day we discovered, quite by accident, that in behind is a tiny walled garden. It’s really quite amazing – on one side of a wall is a huge public square packed with tourists, shops, vendors’ stalls, horse and carriage touts, and on the other is a traditional french kitchen-garden. Beans, squash, cabbage, peas, growing in formally arranged herb-edged plots reminiscent of Versailles. Everything as it might have actually been in the 1890’s. We took full advantage of the peace and quiet to sketch the back of the Chateau. One day I’ll have lunch on the patio there and do the reverse view, looking down at the garden itself. Art-wise, what I like about this sketch is the gradation of detail on that row of brick houses across the street. I quite like the way the roof line turned out. Nice sketch Marc,looks like you had good weather too!